A front-seat view of decisions that are being made by best-in-class employers that will benefit their organizations for years to come. Purchase your tickets and learn from some of the world top business leaders. Early-bird rates available until June 30. Purchase this package to benefit from the conference and annual gala. Early-bird rates available until June 30. Confirmation details and receipt will be sent to this address. Delegate substitutions are permitted until the conference begins. To arrange a replacement delegate, email the details to conference@mediacorp.ca. If you cannot locate a substitute, please notify us in writing at least 30 days prior to the conference and a credit voucher will be issued for the full amount paid. (The voucher is redeemable against any product of Mediacorp Canada Inc., including other conferences.) If you prefer, you may request a refund of the amount paid, less a 15% service charge. No credit or refund is provided for cancellations received less than 30 days before the conference begins. 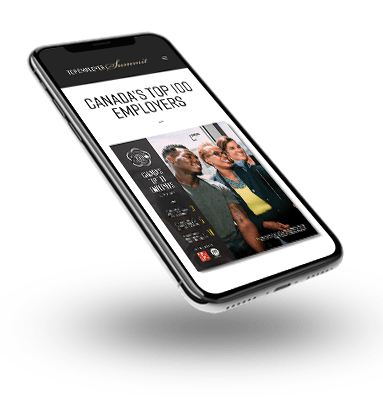 © 2019 Mediacorp Canada Inc. CANADA'S TOP 100 EMPLOYERS and ELUTA are registered trade marks of Mediacorp Canada Inc. All rights reserved. Site by They. Sign Up Now & Receive News and More, Straight to Your Inbox.